For more head, go with any beer in a bottle or can...that's not a stout. Beers in cans and bottles contains a larger volume of dissolved CO2 per liter than beers running out of a tap—the bubbles get trapped more efficiently in the container. Thus, more bubbles to make head. So, dump it into a glass with no second-thought, drink up, and flaunt your new foam mustache. For a longer lasting head, go with a stout like Guinness. Stouts use nitrogen gas to get fizzy which has smaller bubbles than CO2 so they stick around longer. The downside is, they are harder to get going in the first place. To actually get a head with a stout, you must use a special tap to pour it out of the keg so the bubbles actually show up for the party. Or, you could just pick up one of those nifty Guinness cans with the nitrogen ball. 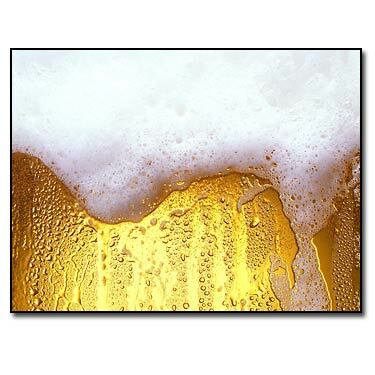 For less head, go for a draft beer, poured slowly down the side of the glass at a 45% angle. Don't let it spill when you get to the end. Pour a stout like this, and if it didn't come from a Guinness bottle or a nitrogen tap, you'll get all beer and no foam at all. Also, if you want to cement your no-head dream, use a dirty glass; oil from bar snacks and lipstick stains kills bubbles. For more head, use a glass that has been etched on the inside—the etchings serve as architecture for bubble formation. For less head, use a wet glass. Experiment with different shapes of beer glasses for different kinds of head with different beers. Ingredients are the key to fine tuning the head of your beer. For a lesser head, add something with lipids or oils like oats or chocolate. More a more fizzy concoction, make sure to use a high protein malt like wheat malt. Bubbles hang onto proteins to form in the first place.